Seasoned, professional divers will tell you that timing is everything in the deep depths of the ocean, especially when you’re scaling the ocean’s floors. No matter if your next diving expedition takes you off the Maltese Islands of the Mediterranean Sea, to the shores of Belize in the Caribbean Islands or to the Fiji Islands in the South Pacific, you’ll want a truly submersible wristwatch ideal for deep-sea diving. First and foremost, you should consider a timepiece that is water-resistant more than 200 meters, preferably 500 meters or more to ensure that there will be no issues with water entrapment in the case. 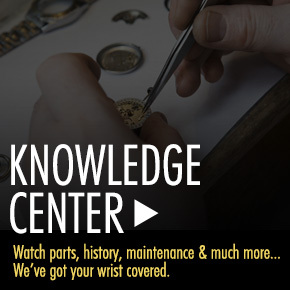 Both 200 and 500 meter water-resistant watches should have a screw-down crown and case back to ensure that water will not enter the case’s inner chamber. 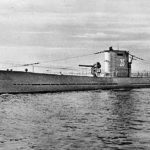 Another item to consider is the material of the watch case and bracelet: both stainless steel and titanium are ideal metals for deep-sea diving, since they are impervious to salt water and will not corrode under such conditions. Matching stainless steel and titanium bracelets are ideal choices, however silicone or rubber straps are also excellent bands for deep-sea diving. A glare-proof crystal is another factor to consider as well for deep-sea diving, since glare could be a factor during your expedition. Although, many air tanks now feature high-tech digital read-outs, you may want to have a unidirectional rotating bezel to record your diving times on your own, especially if you’re a seasoned diver. Finally, it is extremely important to have a highly legible watch dial with luminous hands and hour markers that you’ll be able to see in extremely dark deep-sea conditions. 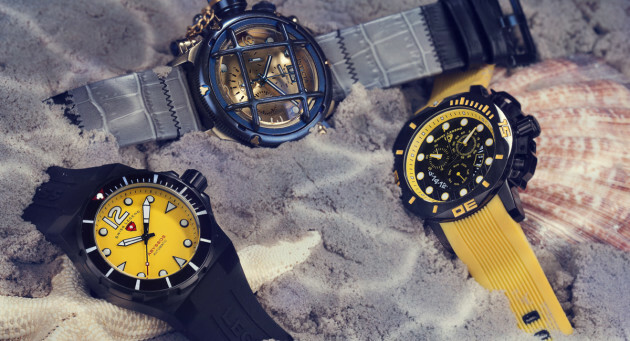 WorldofWatches.com makes it easier to find just the right diving watch this week with our Real Submersible Watches event, featuring true diver’s watches water-resistant to 500 meters or more. 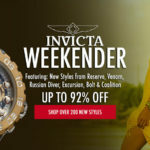 Over 40 high-performance diving watches are featured in the promotion from some of the best names in watchmaking, including Breitling, Bell & Ross, Invicta, Swiss Legend, TechnoMarine and Luminox. 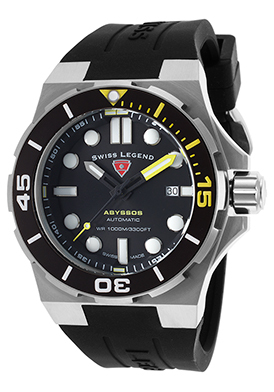 The Swiss Legend Abyssos men’s watch priced under $200 is whole lot of diver’s watch for the money. This Swiss-made timepiece features water-resistance to an astounding 1,000 meters or 3,300 feet. The smooth 46mm brushed stainless steel case is presented on a high-performance black silicone strap. A unidirectional rotating bezel surrounds the legible black dial with luminous hands and hour markers. The precision Swiss-made automatic movement inside assures you of precise time-keeping accuracy. 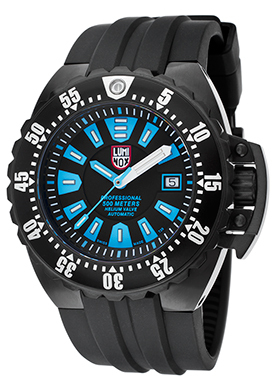 The Luminox Deep Diver 1500 Series automatic men’s watch is an excellent mid-price choice under $1,000. This precision Swiss-made watch is water-resistant to 500 meters or 1,650 feet and has a helium escape valve to use when resurfacing from water and avoid gasses from building up in the case. The rugged 44mm diameter case in black ion-plated stainless steel is presented on a durable black polyurethane strap. The unidirectional rotating bezel encircles the black dial with built-in luminous hands and hour markers. 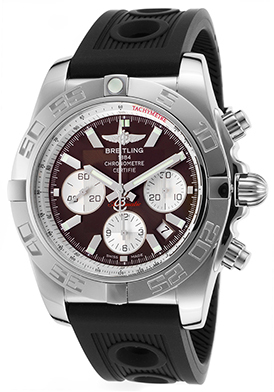 The Breitling Chronomat 44 Flying Fish chronograph is a superlative high-end diver’s watch selection with water-resistance to 500 meters or 1,650 feet. The impressive 44mm diameter case in premium-grade stainless steel has a satiny brushed finish. The rugged black rubber strap is both supple and durable. A unidirectional rotating stainless steel bezel with raised markers surrounds the black dial with three sub-dials, luminous hands and hour markers. 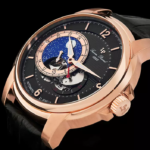 Features include precision Automatic movement inside along with official Chronometer certification from the esteemed COSC (Official Swiss Chronometer Test Institute).